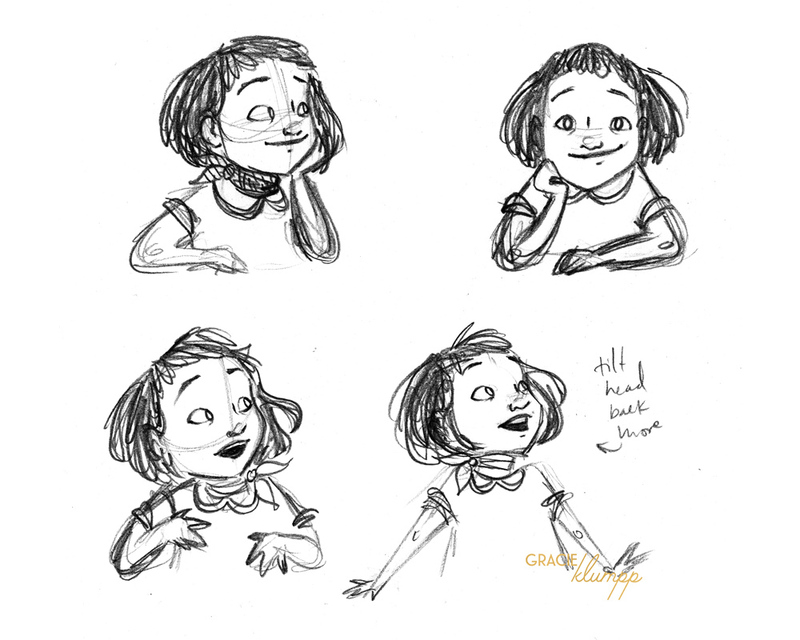 Eleanor (the main character in the text by Art Director Zoe Tucker for my MATS Illustrating Children's Books Class) has gone through some changes and improvements by this point. After initial design and aging her down, it's time to show what she can do in the pages of a children's book, starting with her facial expressions! Last week was all about drawing, drawing, drawing Eleanor feeling all the various possible feels. Many of these expressions don't show up in the text (and I think it would take a LOT for Eleanor get very angry, for example), but we pushed pretty hard on all the possible options in order to show Art Directors what we can do, and what our characters are capable of expressing within 24-36 pages. Below you'll find some of my rough sketches to explore how Eleanor looks when she's angry, excited, surprised, disappointed, etc, the final character sheet I submitted, and a roundup of pages form my sketchbook!